WebSite X5 Help Center - How to set up customer registration in your online store. Customer registration in your store: WebSite X5 Professional from version 14. Choice of purchase mode: WebSite X5 Professional from version 17.
view a list of all the orders they have made on a locked page. Let customers view their orders. save the orders that are made from your online store. All you have to do is go to Step 1 – Website settings, open the Advanced section and click on Data Management: here you will find all the necessary options. NOTE: You can ask your web provider for the details you need for accessing the database, if you don’t already have them. Once the database is linked to your project, you now have to set up your website so that you can manage user registration. 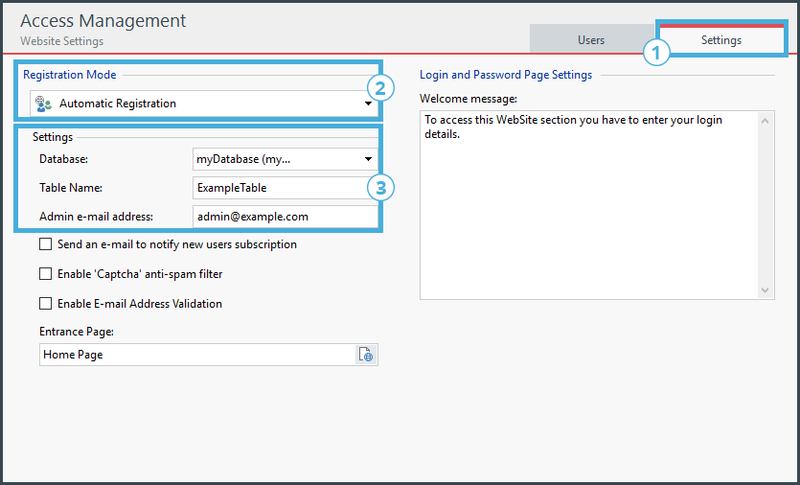 In Step 1 – Website settings, open the Advanced section and click on Access Management. Open the Settings section and select Automatic Registration as the Registration Mode. Still in the Settings section, select the Database that you have linked to your project and enter the Table Name that you want to use and an Admin e-mail address. Now, you can start working on your online store, adding the goods you want to offer and setting up all the necessary steps. NOTE: See http://help.websitex5.com/en/v17/pro/index.html?es_cart.htm" target="_blank">How to create an e-commerce shopping cart for more information on how to set up an online store. 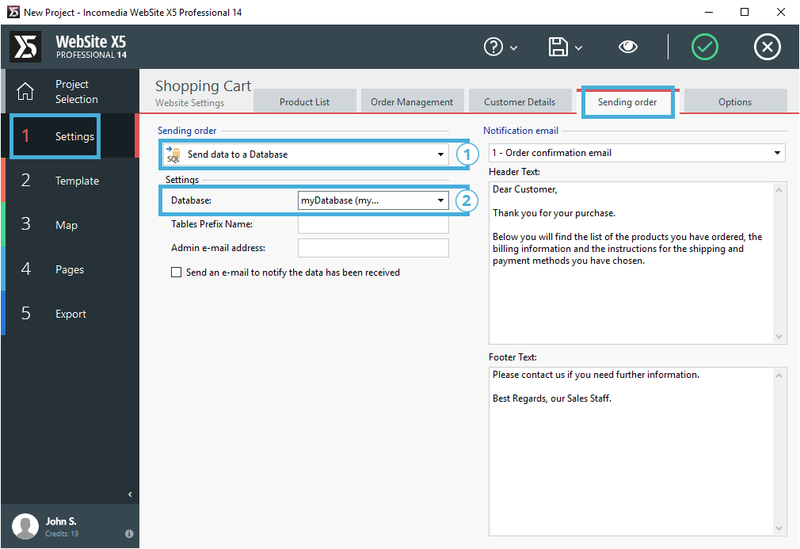 Go to the E-commerce window and open the Sending Order section: select the Send data to a database option as the Sending Order method and, in the Settings section, enter the data of the database that you have linked to your project. Still in the E-commerce window, open the Customer Details section and choose the Purchase with mandatory user registration option as Purchase Mode. By following these steps, you will configure your website so that orders are saved in the database and customers can register when they are in the online store. Alternatively, you can select the User can choose whether to register option, so your customers are free to choose whether to register or not in your online store before finalizing purchase. 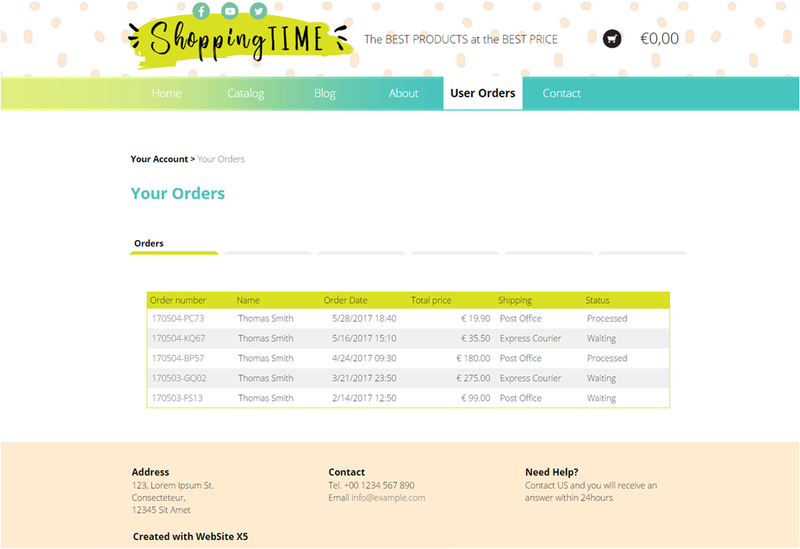 Use the Product List Object: add it to a page and use all the options that are available to create product cards with pictures, descriptions, prices and buy now buttons. This is a quick and effective way to obtain the results you’re looking for. 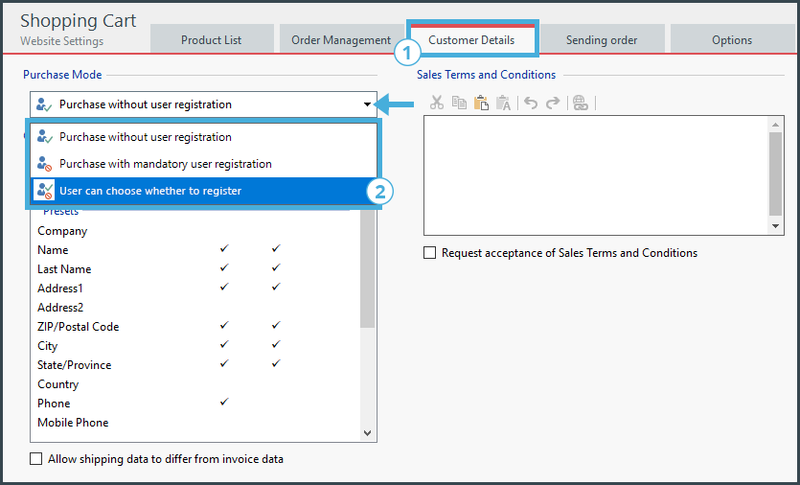 NOTE: See How to work with the Product List object for more information. Create a page for each product manually, adding text, pictures, galleries, videos, etc. When you add the Buy now button, you can start from a picture, caption or button that has been created with the Hover Button and Animated Button optional objects, for example. In any case, you must use the Add to Cart option to link the page to the online store, and specify the product that can be purchased on that page. Go to Step 3 – Sitemap Creation, select the page you want to lock and click on the Locked page. When you are in the Locked Page window, select the Set this page as locked option, click to tick Automatic Registration and then confirm your choice: all the visitors who register with your online store will be able to see this page. Double-click on the locked page to go to the Page Creation. Use the drop-down menu to display the objects in the Data Visualization category: select the User Orders object and drag it into the page layout table so that it will be added to the page. NOTE: If you can’t find the User Orders object, click on the Management button to go to the Object Management window and install it.